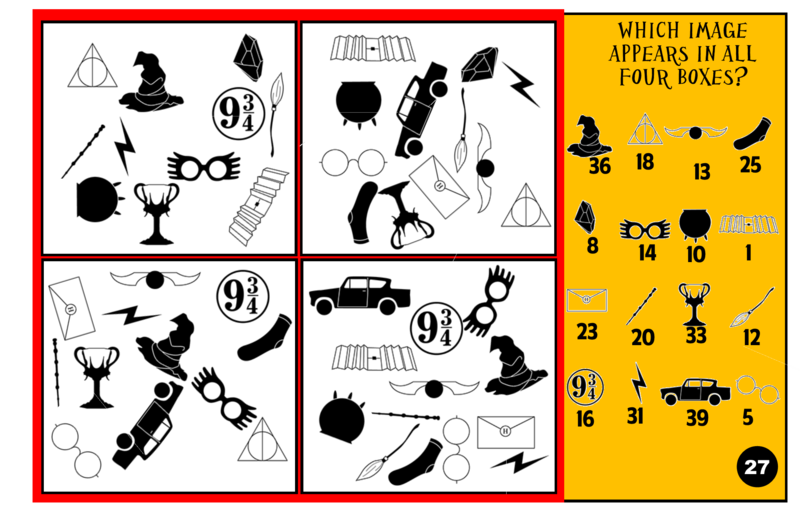 printable HARRY POTTER treasure hunt GAME! 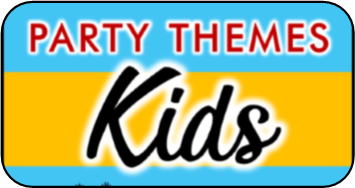 This hunt was created to be played where players may not be all too familiar with the show, such as a birthday party where the child's friends may not be the Harry Potter whiz kid that your child is. 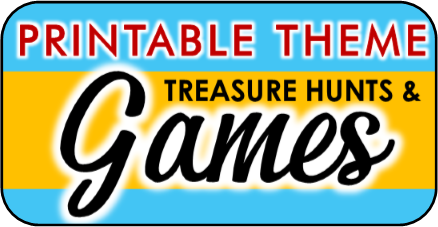 If you are looking for something to challenge and test their knowledge of Harry Potter, Hogwarts, and magic, try our Harry Potter TRIVIA treasure hunt. 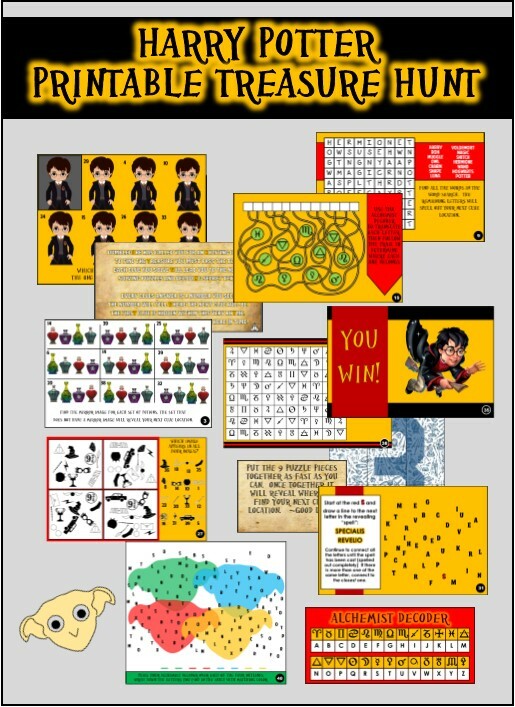 Our Harry Potter inspired treasure hunt is a printable party game that you can play anywhere because YOU decide the hiding locations for each clue. This game includes 10 engaging clues in high resolution eye-catching colors. This hunt is perfect for a Harry Potter themed party. I would recommend this for ages 7 and up. It takes between 45 - 60 minutes to play. How does the Harry Potter treasure hunt game work? Each clue (see clue examples below) has a numerical answer. When players figure out the answer they look up that number on their Clue Master ( shown on right) and they search in the location written next to that number. When you set up the hunt you will fill out the Clue Master with whatever locations you want to use as hiding spots, and fill in the rest of the spots with decoy locations. So if the answer to a clue is for example #4, players will look on their Clue Master and go to whatever spot is located at #4 to look for their next clue. This continues until they have solved all 10 clues. The last clue will lead to the treasure. You can make the treasure whatever you like. We have also included a VICTORY card with this hunt. Once players solve the clue they will look up the answer (which is always a number) on the clue locator guide. The location written next to the correct answer is the place they will find their next clue. This clue involves the Dobby decoder that comes with the game. Beforehand use a hole punch to punch out the eyes of the Dobby decoder. 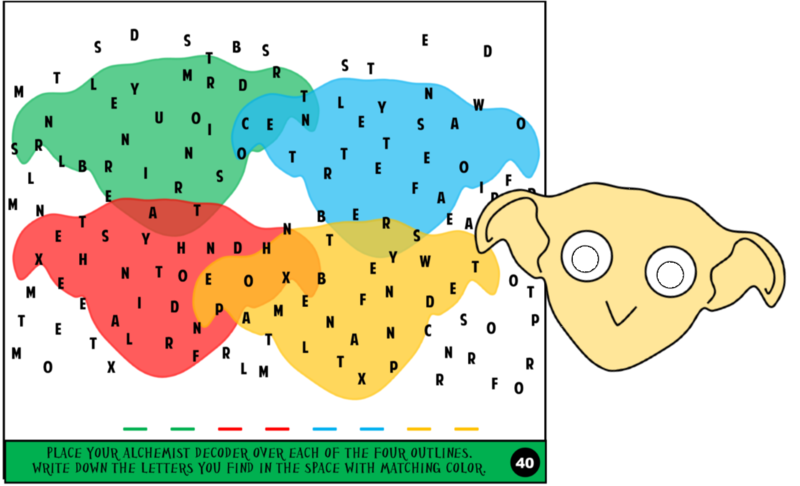 To solve players place the Dobby over the outline of himself on the clue. A letter will appear in each eye. 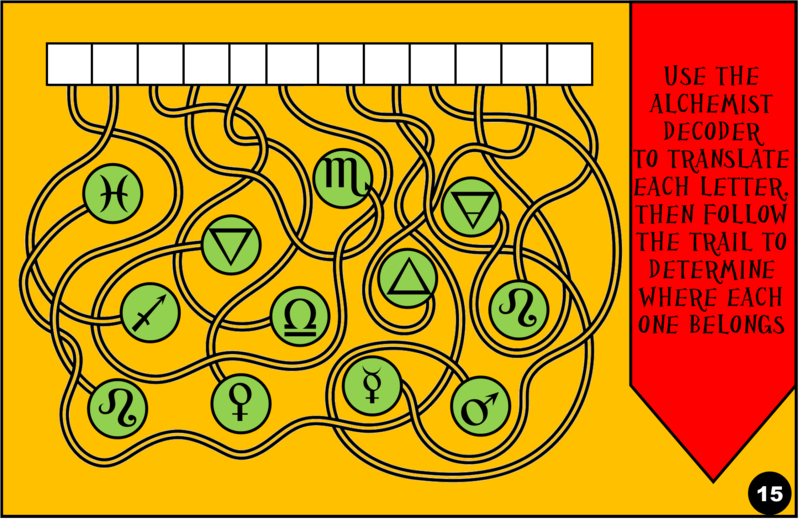 There are four outlines, players circle each letter and write those letters in the space provided. When they are done the number of the next clue location will be spelled out. 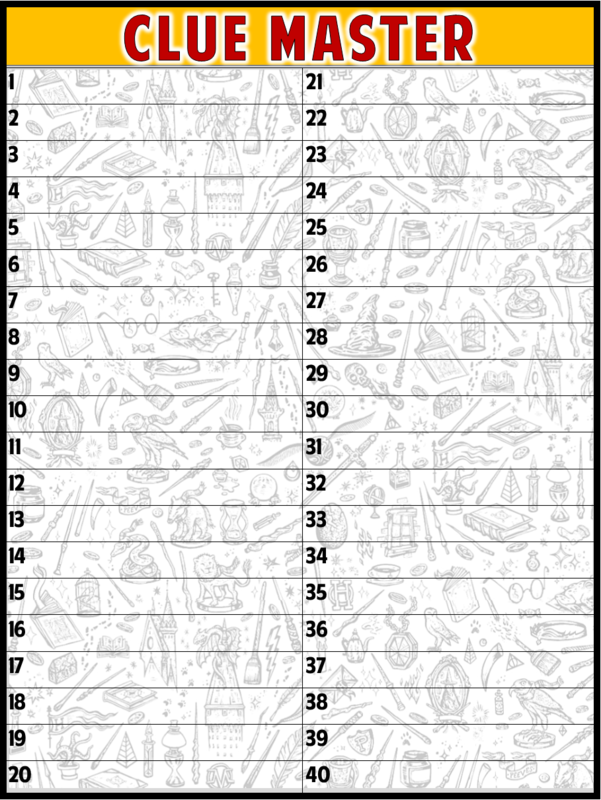 Printable harry potter Treasure hunt game? Should this be played indoors or outdoors? This treasure hunt can be played indoors, outdoors, a mixture of both, at your house, at the park, really anywhere that has hiding places. You decide where the clues are hidden so it is up to you where it is played. Ages 7 and up. Players need to be able to read and do basic addition and subtraction. It truly depends on your group of kids and how hard you hide the clues. I would allot an hour, though they may finish before then. What items will I need other than the hunt itself, to set up and play this game? Do all players play together or race against each other? It is up to you! The instructions provided include a how-to for both a cooperative hunt, this is where all players work together to reach the end. It also includes instructions on how to play a competitive version of the hunt. This is where players compete against each other to be the first to find the treasure. How long does it take to receive the download? Once you order the files should arrive via email within moments. If you do not see them please check your junk folder before contacting me, that is the usual culprit. What kind of file does it come in? All the files come in high resolution PDF's that you can open with adobe reader. This comes already installed on many computers, but if you do not have it you can get it for free at adobe.com. How do I contact you if I have any more questions? what all is included in the Harry potter hunt?